IMMIGRATION at the Hong Kong-Zhuhai-Macau Bridge (HZMB, 港珠澳大橋) will work around the clock on the day of its opening, but there will be no ‘co-location’ on the bridge, Transport Secretary Frank Chan Fan (陳帆) said. Speaking at the Legislative Council (立法會) on 17 January, Chan said the three governments are working to finish construction on the boundary crossing facilities. Interior, electrical and mechanical works have to be completed on the Hong Kong section inside the clearance building. Road surface work also needs to be done. But Chan said last week that outstanding works were due to be completed during that time. After that, the government will install and test a traffic control and surveillance system. The transport chief also said immigration on the bridge will be open 24 hours a day when it is officially opened. “The governments of Guangdong (廣東), Hong Kong and Macau (澳門) have already reached a consensus that 24-hour clearance should be implemented from the date of the commissioning of the boundary crossing facilities of the HZMB. The three sides are currently working on the related support arrangements accordingly,” he said. Chan remained tight-lipped on the commencement date of the bridge, although Chinese state media earlier reported that it would open in May. He said each government will conduct clearance work within its own territory, which means there will not be a ‘colocation’ arrangement in place. 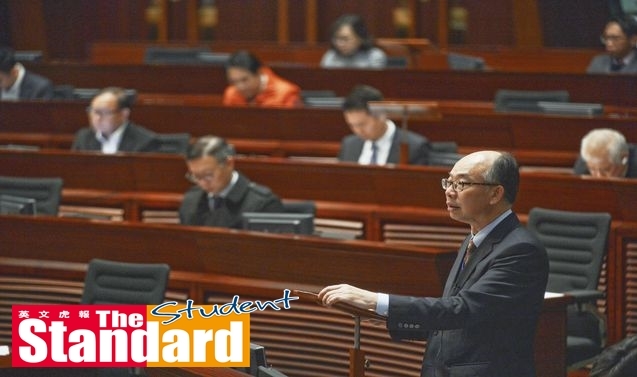 Heung Yee Kuk (鄉議局) lawmaker Kenneth Lau Ip-keung (劉業強) had requested projections on the daily traffic flow on the bridge in the early days of its commencement. Chan, however, said such estimates are meaningless. “Given that the HZMB is about to be commissioned, we think that there is not much meaning in making projections on traffic and passenger flow at the initial stage of commissioning,” he said. A consultant, however, was hired by the three governments to estimate the daily traffic volume by 2030 and 2037. Chan estimates the figures at about 29,100 and 42,000 vehicles, respectively. This translates to about 126,000 and 175,000 passenger trips a day, respectively. Chan, however, pointed out that “since the aforementioned medium to long-term projections focused on a timeline 10 to 20 years from now, the estimates may vary”. After the opening of the bridge, travel time between Zhuhai and Hong Kong’s International Airport will be reduced from four hours to about 45 minutes, he said. Meanwhile, a Civic Party (公民黨) lawmaker asked Chan to reveal if detention rooms and an arsenal will be set up inside the Mainland Port Area (內地口岸區) of the express rail’s West Kowloon Terminus (西九龍站). Chan declined to give a straight answer, saying the matter does not fall under Hong Kong’s jurisdiction.